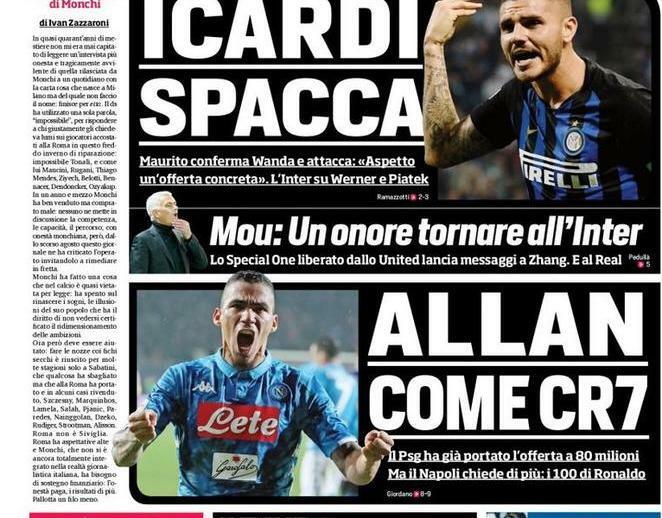 Psg are strongly interested in Napoli midfielder Allan and according to Il Corriere dello Sport, the Ligue 1 giants have made an € 80 million that, however, was rejected by the Serie A giants. The Rome-based paper claims Napoli President Aurelio De Laurentiis dream of selling the Brazilian star for a fee close € 100 million (including add-ons). Just six months ago, Juventus signed Cristiano Ronaldo for a similar fee: 112 million. Allan’s agent Juan Manuel Gemelli met Cristiano Giuntoli yesterday to discuss about his client’s possible move to Paris. The Ligue 1 giants offer a lucrative contract to the Brazilian who, however, is not pushing to leave the club. If Napoli will give green light to sell the Brazilian, then the player would not take too long to agree terms with the French club that will face Manchester United in the last-16 stage of the Champions League. If Allan leaves Napoli in January, Cagliari star and Chelsea target Nicolò Barella would become Napoli’s priority for the midfield. The Italian starlet has a € 50 million price-tag.